Kirk Hopper Fine Art is thrilled to welcome back artist Floyd Newsum for his latest solo exhibition, entitled The Things I See. This exhibit will feature Newsum's newest and most ambitious work to date. I View the Cross Billy, 2017, oil, acrylic, mixed medium and collage elements on paper, 16" x 33"
Newsum's work is often filled with a signature combination of undulating marks and abstract patterns that take the form of glyphs, alluding to Floyd's own story and upbringing. His compositional style generally feels childlike; however, his subject matter centers on deeper meanings of cultural climates, political statements and personal events. His naive style echos African culture and serves as a blended creation of spirit works and ancestral stories. The contour line drawings of a floating woman in The Run and in Spirit and Serpent are prime examples. Floyd's use of the floating woman pays homage to the great women that have impacted his life; they become free floating spirits making their presence known to their viewer. It is no surprise that Floyd places such a strong emphasis on depicting women in his works. After all, women are the bearers of life. They nurture and protect. 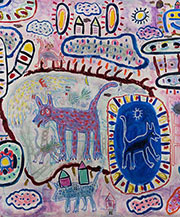 Other images such as dogs, birds and fish can easily be seen in Floyd's work as well. The dog, bird and fish are obvious and hidden symbolisms he creates as a dialogue to represent fidelity, grace and the ability to soar and overcome struggles. Throughout art history, artists such as Jan Van Eyck and early Renaissance artists have incorporated these same elements to give important meaning to an event. Ladders and houses are also visual elements incorporated into his compositions, representing family and his father who was one the first fire fighters in Memphis. The ladder and house become metaphors for faith, family structure and the ability to overcome obstacles. Newsum has an uncanny ability to harmoniously introduce vignettes through vivid staccato strokes of undulating line. His slow reveals acknowledges what a great storyteller he really is. Floyd Newsum, a painter and printmaker with a career spanning four decades, is a Houstonian by way of Memphis. Currently a University of Houston art instructor, he spent his childhood years in Tennessee and received his BFA in Memphis before moving to Philadelphia where he earned an MFA in Fine Art. 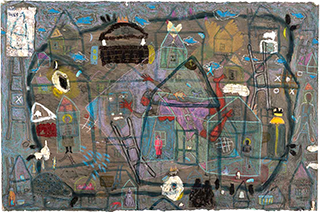 Recently, the Smithsonian National Museum of African American History and Culture acquired two of Newsum's paintings. His work belongs to many private collections such as, Alice Walton Proietti, Lester Smith and Gerald and Anita Smith. As well as in numerous museum collections, including the Philadelphia Museum of Art and the Museum of Fine Arts Houston. The Spirit and the Serpent, 1989-2017, gouache, graphite, mylar and ink on paper, 13" x 16"
D Oh' Gee at Play Time (detail), 2017, acrylic, oil and photo on paper, 55" x 82"